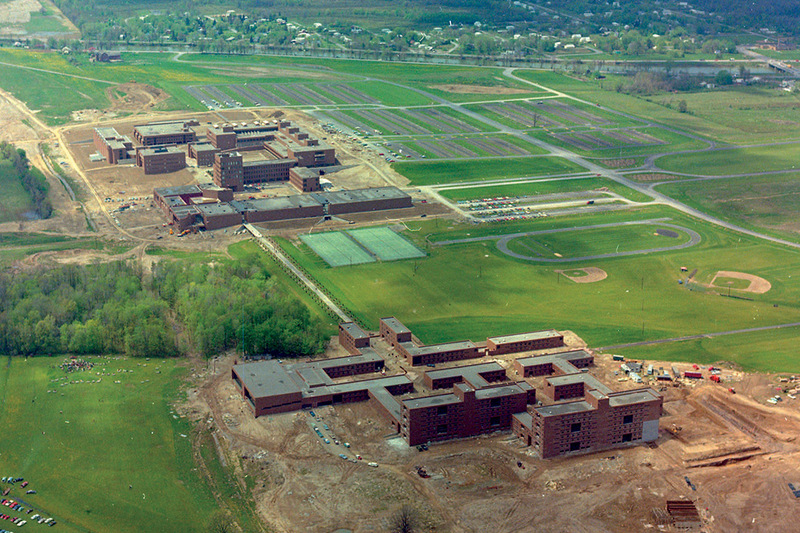 Transforming the Landscape: Fifty Years on the New RIT Campus explores the Henrietta campus’s growth from its original design to its latest LEED-certified buildings. When Rochester Institute of Technology left downtown Rochester and opened its new Henrietta campus in 1968, it laid the foundation for tremendous growth. To celebrate the modern campus’s 50th anniversary, a new book by RIT Press details its planning and construction coupled with an extensive photographic survey of its innovative architecture. Transforming the Landscape: Fifty Years on the New RIT Campus features an essay by Sarah Thompson, associate professor of art history, that explores the campus’s modernist beginnings and explains how more recent LEED-certified buildings compliment the original 1968 design. Becky Simmons, the book’s editor and RIT Archivist, worked with her team and Jennifer Poggi, assistant professor of photojournalism, to compile hundreds of images for the book that provide readers a comprehensive tour of the campus then and now. Simmons found the project enlightening and hopes it will help readers develop a new respect for the campus design. Two companion exhibitions titled “Rewarding Investment in Tomorrow” will be on display beginning Oct. 19 in the University Gallery and in the RIT Museum on the third floor of the Wallace Library. An exhibit opening and book launch event takes place from 11 a.m. to 2 p.m. on Saturday, Oct. 20 at the University Gallery. A second book launch will take place from 3 to 6 p.m. on Thursday, Nov. 8 at the RIT Museum. Tours of RIT’s former downtown campus begin at 2 p.m. on Friday, Oct. 19 as well as a guided tour of the current campus’s art and architecture at 2 p.m. on Saturday, Oct. 20. For additional events celebrating the RIT campus’s 50th anniversary, visit www.rit.edu/henrietta50. Transforming the Landscape: Fifty Years on the New RIT Campus is available in hardcover for $34.95 at the RIT Press website or by calling RIT Press at 585-475-6766. RIT Press is the scholarly book publishing enterprise at Rochester Institute of Technology—dedicated to the innovative use of new publishing technology while upholding high standards in content quality, publication design, and print/digital production. The Press offers specialized titles for niche academic audiences, trade editions for mass-market audiences and occasional limited editions with unique aesthetic standards.